When I received a phone call in the early hours of that Thursday morning, I was delighted to observe that it was a foreign call coming from Cameroon. I could readily recognize that the number belonged to a friend; Ngala Ndi. I was happy I would have a chat with an old friend who was still at home; that we’ll talk of old memories and discuss future prospects. After exchanging pleasantries, Ngala did not know how to convey the news to me, perhaps owing to the fact that he knew how close I was to BB. So he started by saying that BB had an accident on his way to Yaounde. I screamed and said BB just sent me a mail a day earlier, informing me of his new book to be launched on Wednesday 7th March 2007. It might have been wishful thinking when BB sang the dirge of the dictators around him in Requiem for the last Kaiser. Ironically, the Kaisers are still around and would learn of BB’s requiem with guessable pleasure. When BB an outspoken critic wrote The Most Cruel Death of the Talkative Zombie, about the dehumanised race (the living dead or zombies) that he and his kith and kin had been reduced to; or is it the talkative zombies they have become, he didn’t think he would die in the cruel way he did. BB was talkative – or better still, penkative - as his pen never stopped flowing while bemoaning the plight of the downtrodden. But he didn’t know he would die in so cruel a way. Indeed, “What a way to die?” - to borrow from another prolific writer and teacher, Dr. Linus Asong. 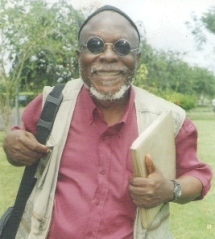 A common (in fact the most prevalent) theme in Bate Besong's writings (fiction and non-fiction) is the fate of Cameroon's English-speaking minority whom he referred to in his famous Beasts of No Nation as 'nightsoilmen" locked up in the antechamber of the bilingual republic; a people whose culture, history and even existence was an afterthought to the French-speaking majority of the bilingual Cameroon Republic. when one can still taste the salt from one's tears? 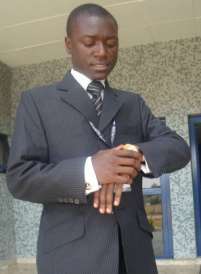 "May Bate Besong the Great Bard Find Eternal Rest"
Today (15 March, 2007) I just received an e-mail from a former schoolmate at the university of Calabar informing me of the tragic death of Bate Besong. Although we were in the same department (English & Literary Studies), Besong was two years ahead of me and among the first English graduates of the University of Calabar. The name Bate Besong first confronted me in the pages of The Nigerian Chronicle, that Cross River State Government-owned paper.This was in 1978 and his poems featured regularly in the literary column. I was to meet him in the flesh a few months later in October of that year when I went to the University of Calabar to take a degree in English and Literary studies, the same course BB was reading.